The Canadienne is the only breed of dairy cow native to North America, developed in French Canada during the 16th to 17th century from breeds imported from Normandy and Brittany. It was bred for hardiness in the rugged Canadian climate, becoming so well adapted that it did not require expensive imported feed or intensive management. In 1850, there were at least 300,000 Canadienne cows in Canada but numbers began to dwindle due to Canadian government policies and the contemporary dairy industry, which favours dairy cows that produce milk in large volumes. While the Canadienne does not produce milk in as large volumes as other breeds, it produces milk that is very high in fat and protein, making it excellent for cheese and butter production. Unfortunately Canadienne stocks today are seriously threatened, with current estimates placing the breed at approximately 1,000 heads. Rare breed farmers in Ontario, Quebec, and the Isles de la Madeleine, however, are working hard to increase numbers and maintain the breed. 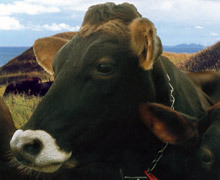 The Association for the Development of the Canadienne Cattle Breed in Charlevoix is also actively involved in preserving, protecting, promoting, and growing this unique Canadian breed. Cheesemakers in Quebec, in particular Laiterie Charlevoix and Fromagerie Pied-de-Vent, are currently producing cheeses made exclusively from the milk of Canadienne cows.